Looking for an affordable floor system that’s durable and long-lasting yet attractive? You don’t need to sacrifice on any of these qualities with epoxy flooring in Riverside, CA. An epoxy concrete floor is decorative enough for a home, high-end hotel lobby, or shopping center yet practical and economical. In just one or two days, our epoxy flooring contractors can transform an ugly, dusty slab of concrete into a finished floor system that can last decades against chemical spills, foot traffic, hot tires, and even more. We use only high-grade epoxy floor coating products to deliver superior results that last. Unlike some epoxy garage floor installers you may encounter, we take the time to do the job right. That means repairing and prepping your concrete surface with diamond grinding and a high-quality primer before applying custom epoxy flooring to your performance and design needs. We don’t skimp on product quality, either; we use industrial-grade 100% solids epoxy products that won’t chip, delaminate, or break down prematurely like lower quality epoxy “paint” and DIY kits. We believe that a quality epoxy concrete floor is an investment in your home or business. Of course, achieving the potential of garage floor epoxy requires not only choosing the right product but also working with the right installers who won’t cut corners that can lead to premature floor failure. Don’t take our word for it; here are the time-tested benefits of epoxy flooring in Riverside that our installers live up to. Our epoxy flooring contractors are dedicated to superior customer service and beautiful results that last. 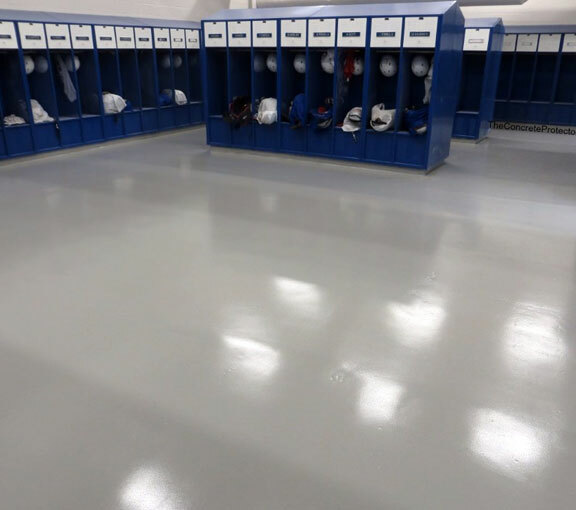 Whether you’re envisioning an elegant and pearlescent metallic epoxy floor for your garage or a decorative flake epoxy floor for your business, we can help. A flake epoxy coating is a popular decorative option that’s a step above a solid-colored floor. We broadcast multi-colored flakes over your epoxy base coat to add visual interest and texture. Many people find that flake epoxy flooring looks very similar to granite. This design option is popular for garages as well as offices, medical facilities, churches, and more. Want the ultimate floor that looks like nothing else? A metallic epoxy floor coating is the perfect way to add the “wow” factor to your garage or lobby. Metallic epoxy floors are created with your choice of metallic pigments that are agitated to add depth and movement to the floor. This floor style can look like molten metal, ocean water, marble, and much more. Quartz epoxy is a popular decorative option that looks elegant but also increases the durability and performance of an epoxy flooring system. Quartz doesn’t just create a high-performance floor system; it also adds a safe, skid-resistant texture. We add your choice of colored quartz granules to the epoxy to add vibrant color and texture. One of the most popular applications for epoxy flooring? Garage floor epoxy that creates a dust-free, colorful, and bright garage perfect for working on your car or hobbies. An epoxy garage floor coating in Riverside, CA is an affordable way to update your garage, protect your concrete, and even boost your home’s value. Along with metallic, flake, and quartz epoxy, we offer other ways to customize the look and feel of your epoxy flooring in Riverside. You can choose solid colors in every color of the rainbow or mix and match colors and design effects in custom patterns and designs such as checkerboard, stripes, geometric shapes, and even logos.